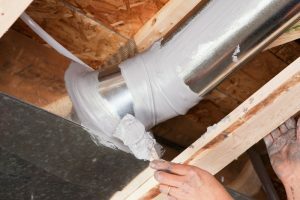 Have Your Ducts Repaired for Better Furnace Performance | Comfy Heating Air Conditioning Inc.
Do You Need Duct Repair? If you suspect your HVAC system isn’t working efficiently, have the ducts and the system checked. You also may suspect something is up if you notice a loss of heating power, loss of airflow, or hear loud rattling coming from your vents. If your ducts are affected by leaks, poor connections, or poor initial installation, you may experience problems leading to poor furnace efficiency and a decline in comfort. Not many homeowners think about this, but improperly sized ductwork is one of the biggest problems for HVAC systems, if that ductwork wasn’t installed properly in the first place. It will create problems from the start by way of restriction of blockage of airflow. You may not even notice at first unless it’s making significant noise that you know is not normal. If air ducts are too big for the HVAC system they’re connected to, it reduces airflow, resulting in uneven temperatures throughout the home, since conditioned air won’t be reaching all of the vents. This is a strain on both your furnace and your wallet. Your HVAC system will struggle to reach the desired temperature you set on the thermostat, and as a result these systems will start degrading and aging rapidly. This means you’ll soon find yourself facing significant furnace repairs such as motor failure, prematurely worn fan belts, and compressor damage—or even a broken down heating system. There’s an issue that can affect any aging ductwork, no matter how well or how poorly it was installed, and that issue is ductwork in a hot attic with inadequate protection from the heat of the sun. If pinhole leaks start to occur as a result, both your furnace and AC will suffer. If your ductwork does have pinholes or any other type of damage, you’ll want to get them professionally sealed (and no, duct tape is not the proper solution—it’s actually poorly named). Adequate insulation is also important. Not only is this true right now when we want to keep the heat in, but it’s true later on as well—well-placed and cared for insulation will help keep heat out in the summer, and protect HVAC systems from inclement conditions. For professional Oakland, CA furnace services and more, contact Comfy Heating & Air Conditioning Inc.